Selected Science News: ANSWERING THAT AGE-OLD LAMENT: WHERE DOES ALL THIS DUST COME FROM? ANSWERING THAT AGE-OLD LAMENT: WHERE DOES ALL THIS DUST COME FROM? Where does it come from? Scientists in Arizona are reporting a surprising answer to that question, which has puzzled and perplexed generations of men and women confronted with layers of dust on furniture and floors. Most of indoor dust comes from outdoors. In the study, David Layton and Paloma Beamer point out that household dust consists of a potpourri that includes dead skin shed by people, fibers from carpets and upholstered furniture, and tracked-in soil and airborne particles blown in from outdoors. It can include lead, arsenic and other potentially harmful substances that migrate indoors from outside air and soil. That can be a special concern for children, who consume those substances by putting dust-contaminated toys and other objects into their mouths. The scientists describe development and use on homes in the Midwest of a computer model that can track distribution of contaminated soil and airborne particulates into residences from outdoors. 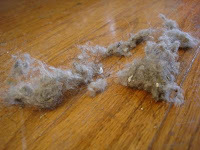 They found that over 60 percent of house dust originates outdoors. They estimated that nearly 60 percent of the arsenic in floor dust could come from arsenic in the surrounding air, with the remainder derived from tracked-in soil. The researchers point out the model could be used to evaluate methods for reducing contaminants in dust and associated human exposures.